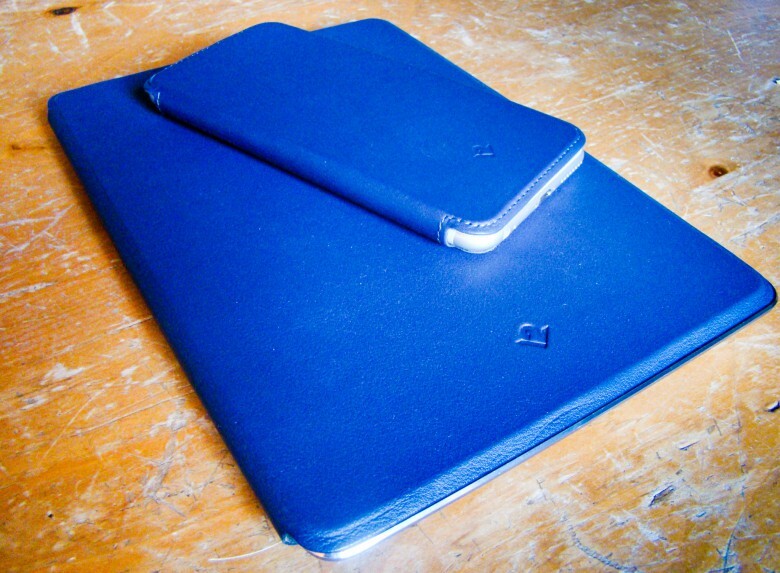 These lovely, leather folios are delightfully classy. 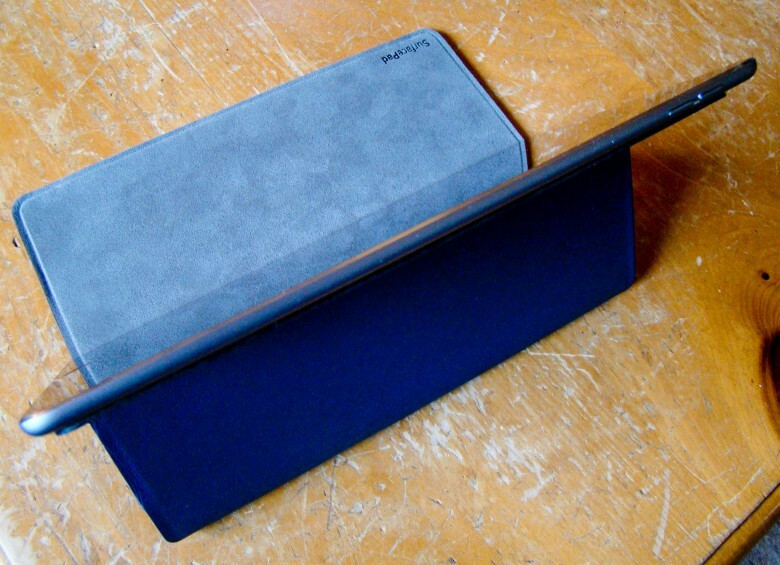 SurfacePad for iPhone and iPad solves a problem I have with most folio-style cases. These tend to cover up too much of the gorgeous Apple design without giving much in return. There’s always a trade-off between form and function. If you’re going to hide the gleaming Apple devices behind a case, at least make it look as classy and useful as Apple does. The SurfacePad for folio cases from Twelve South are delightfully minimal, covering the front and rear of your iPad or iPhone in luxurious leather without sacrificing a refined look. 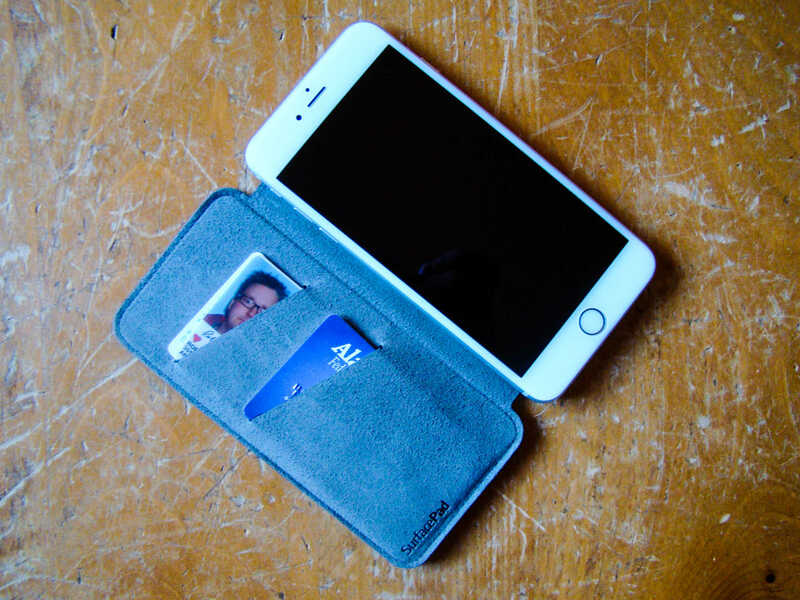 I’ve used a lot of folio cases for my iPhone 6 Plus, and plenty of wallet cases, as well. The SurfacePad for iPhone is easily the best-looking one I’ve seen, with a non-destructive sticky back panel that adheres to the rear of my iPhone and a wraparound cover that beautifully protects my iPhone screen when closed. The back panel adheres nicely to my iPhone, but also comes off if I need to slide my iPhone into a battery or waterproof case. SurfacePad sticks right back on when I’m done, too. I can easily fit a couple of cards in each of the two slots, which are made of a fine microsuede material that ensures my iPhone screen isn’t scratched. I even drop a flat metal panel into the lower slot to allow my iPhone to connect to the magnetic iPhone holder on my car’s dashboard — a lovely mashup of two iPhone accessories. The iPhone SurfacePad also allows for hands-free viewing, with a flexible back panel that makes it super easy to set up on its side in landscape mode — perfect for learning guitar technique from YouTube or watching a movie on a long flight. I do have trouble managing the front panel when taking photos with my iPhone, though that’s a function of the folio style than anything wrong with the design. The SurfacePad for iPhone is a stunningly gorgeous, well-made folio-style wallet case that comes in seven different colors, including Camel, Red Pop, Modern White, Jet Black and two new colors for 2016 -– Lavender and Midnight Blue, to match your style. Propping up your movie habit is a cinch. Perhaps even more stunning is the larger SurfacePad for iPad. The review unit I tested is made of deep blue leather that just begs to be touched, and wouldn’t be out of place on a fancy bookshelf. The rear panel sticks to my iPad Air 2 with a surprising amount of solidity, but it’s also just as easy to peel off. When you’re done, just stick the SurfacePad back onto your iPad with no fuss or muss. The inside face of the SurfacePad for iPad has the same soft microsuede covering in a contrasting color as the iPhone SurfacePad does, keeping my iPad’s screen protected from scratches and dust. The cut of the SurfacePad melds perfectly with my iPad, too, showing off the stylish chamfered edges while protecting front and back with ease. Better yet, the SurfacePad for iPad has both a kickstand for a typing setup and a magnet in its front panel that allows for a more upright, hands-free viewing of the screen. The kickstand drops down from the rear panel and connects to the inner magnets, letting the iPad sit at a slightly raised angle, perfect for typing or tapping away on your favorite game. The more upright angle uses the iPad’s own magnets to secure it in landscape mode on your desk or in-flight tray table to let you watch movies or read iBooks in style. There’s a SurfacePad for all the iPad models (except the 12.9-inch Pro), and a new iPad Pro 9.7-inch SurfacePad is in the works. There’s also a SurfacePad for all iPhone 6 and 6 Plus models, including the “s” line. The colors mix and match incredibly well, and they complement any Apple Watch band you might have, too. Ultimately, you’ll want to get one of each, in either matching or complementary color combinations. The minimal, folio-style SurfacePad by Twelve South makes your iPhone and iPad classier than ever and adds a couple of useful tricks to get even more function out of your iOS gadgets. At $79.99 for the iPad Air and Air 2 SurfacePad models (ten dollars less for the iPad mini versions), and $39.99 for the iPhone 6 or 6s version (ten dollars more for the plus sizes), you can’t go wrong on price. With the beautifully pebbled leather and minimal wraparound design, you won’t go wrong on looks, either. Twelve South provided a review unit for this article. Read Cult of Mac’s Reviews Policy.